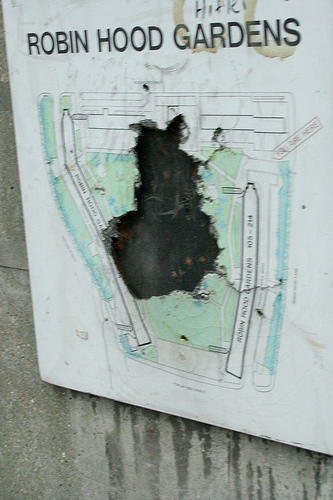 What more is there to be said on Robin Hood Gardens? Its architecture and its planned demolition have inspired voluminous and passionate writing on both sides of the debate – it’s become less a council estate, more a proxy in a cultural war. This story begins in 1963 – though it stretches back further, of course, in terms of East End housing problems and the visions of politicians, planners and architects in solving them. 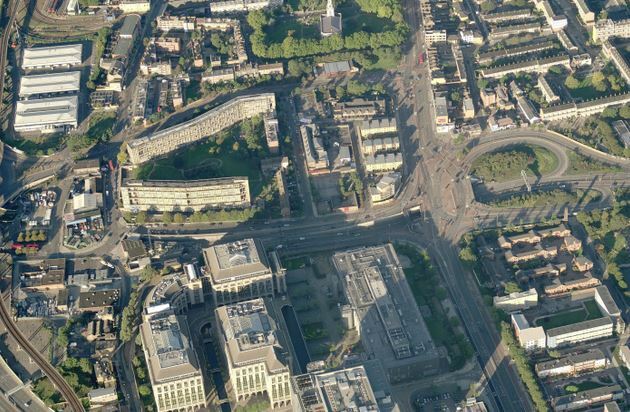 Still, in that year, three small areas of land became available to the then London County Council for redevelopment. 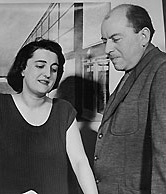 Alison and Peter Smithson were commissioned to draw up designs for two separate buildings with plans for further which would form ‘one big linked dwelling group’. 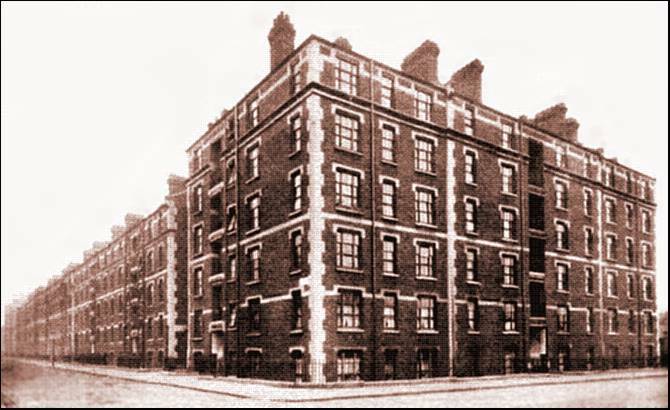 Two years later, the Greater London Council decided to demolish the adjacent Grosvenor Buildings – seven private tenement blocks opened in 1885, replacing slums cleared by the Metropolitan Board of Works. The council acquired 1200 tenants in need of rehousing and an additional five acres of land. The Smithsons acquired a new drawing board for their vision. an exemplar – a demonstration of a more enjoyable way of living in an old industrial part of a city. It is a model of a new mode of urban organisation which can show what life could be like. They were influenced, of course, by le Corbusier’s Unité d’Habitation but had pioneered their own version of ‘the building as street’ in rejected plans for the City’s Golden Lane Estate in 1952. Construction began in 1968, the first flats opened in 1971 and the scheme as a whole was completed in 1972 at a cost of £1,845,585. 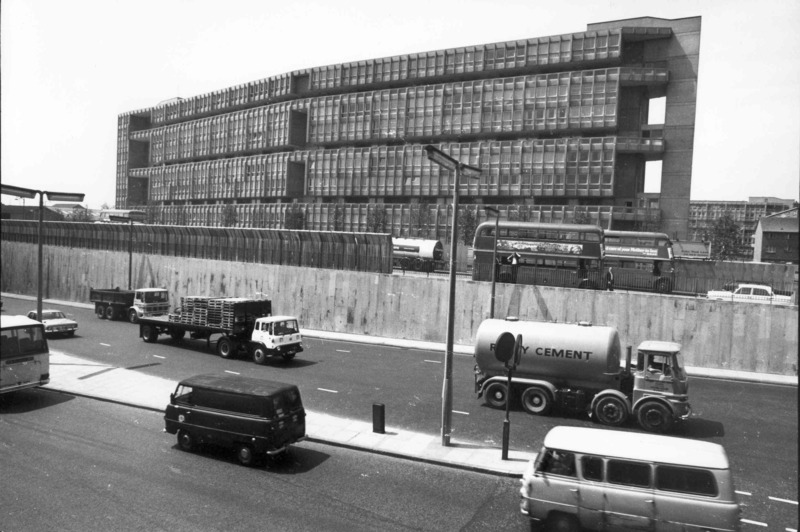 It comprises two precast concrete-construction slab blocks – a ten-storey building adjacent to the Blackwall Tunnel approaches and a seven-storey running, more or less in parallel, along Cotton Street. These are, visually, a fairly uncompromising example of Brutalist design. There are 214 flats in all – 38 flats intended for old people at ground level and a mix of two- to six-bedroom maisonettes for the rest with a population of around 700 at a housing density of 142 persons per acre. The flats are spacious and well-lit. The site was – and remains – problematic, sandwiched as it is between three busy roads. The Smithsons countered this with a ‘stress-free central zone protected from the noise and pressures of the surrounding roads by the buildings themselves…a quiet green heart which all dwellings share and can look into’. (2) They compared this open space – a little fancifully maybe – to a Georgian square. One of the men on site said that this, what we were trying to do, was too good for the people that were going to live in it. We find this unacceptable to say that it is too good. 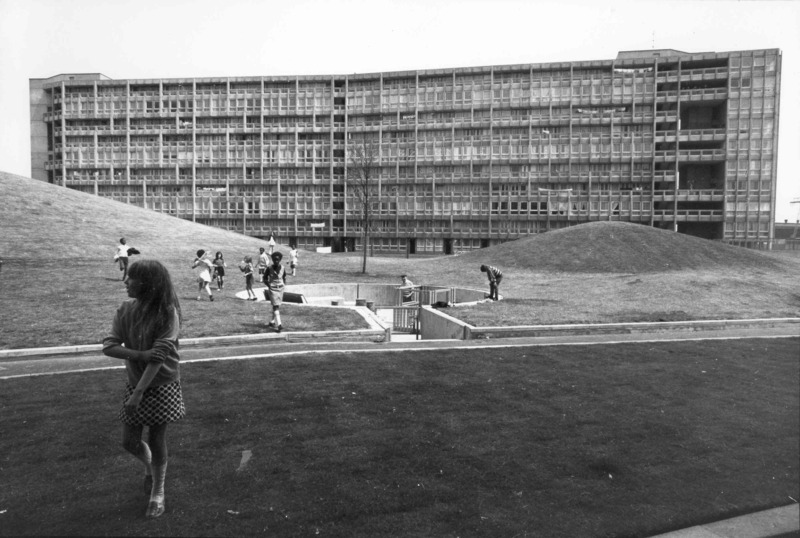 The Smithsons wanted the new Robin Hood Gardens to offer dignified, even – in their own terms – homely, accommodation for those who would live in the estate. The deck itself is wide enough for the milkman to bring his cart along or for two women with prams to stop for a talk and still let the postman by. 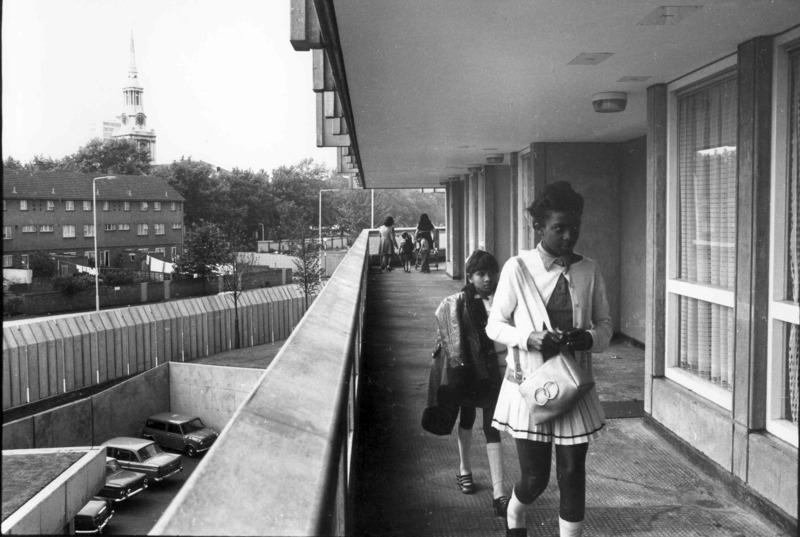 Additionally, although Robin Hood Gardens didn’t get the ‘yard gardens’ that the Smithsons had planned for Golden Lane, they did create small alcoves – they called them ‘pause places’ – off the decks which they hoped residents would personalise through the use, for example, of flower boxes. 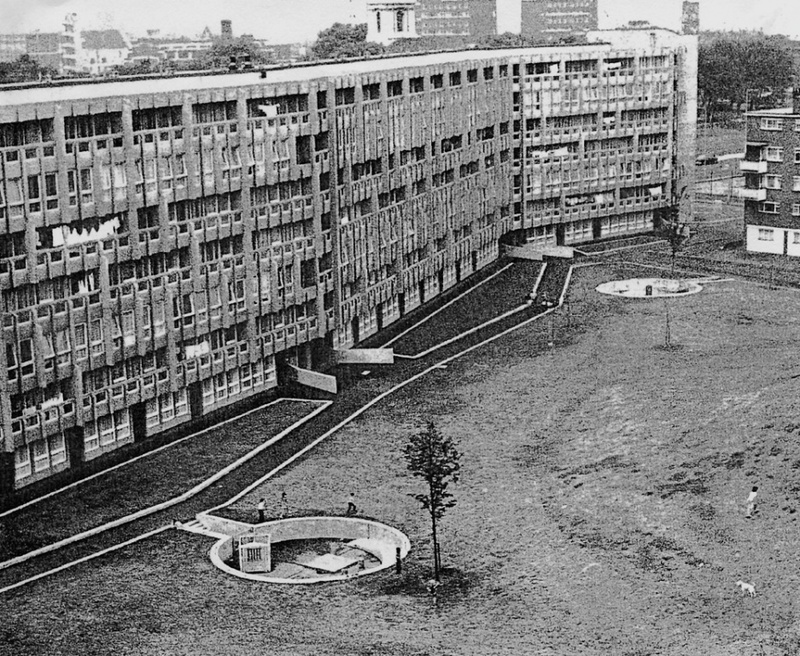 Although Robin Hood Gardens is of unusual design and has attracted much attention…only through the people who live here will it achieve any real life. For it is how the place is used that finally decides the quality of life that a family can live here….It is now your turn to try and make it a place you will be proud to live in. Here he echoed Oscar Newman’s critique in his book Defensible Space which had been published one year earlier. Newman contended that public high-rise developments were particularly liable to crime and antisocial behaviour as their residents felt no sense of ownership or responsibility for them. Design flaws typically acted to facilitate such behaviour. They are under-used; the collective entries are paltry and a few have been vandalised. Indeed they are dark, smelly, dank passage-ways, places where, as Oscar Newman has argued…, crime may occur more frequently than elsewhere. The access to the building is, to our mind, ill-conceived: the ‘stress-free’ zone is abused: the lack of common privacy is a constant worry: the vicious writing-on-the-wall is hard to ignore, and is undeniably related to much of the mindless vandalism that has broken down the communal facilities. The tenants do not make use of the decks and, consequently, the idea of ‘street’ does not have any factual validity…[Our] final assessment must be that, socially, the building does not work. The lucidly argued Smithson aesthetic fails at Robin Hood. Beyond the alleged design flaws and social issues, structural problems had also emerged. A 2006 survey found the blocks to be ‘in poor condition’ with significant defects to the external envelope and roof coverings. It recommended the replacement of existing bathrooms and kitchens and identified problems with electrical wiring and other services. A 2007 study concluded it would cost £70,000 per flat to bring them up to the Government’s Decent Homes Standard. Tower Hamlets Council, the successor landlord to the GLC, voted for demolition in 2008 – a decision apparently supported by over 75 per cent of residents. We’ll come back to that too. This, it turned out, was the beginning rather than the end of the debate about the future of Robin Hood Gardens. At this point the Great and the Good of British architecture weighed in. They argued passionately that the estate should be saved. We’ll follow that debate and appraise its outcome next week. (1) ‘The Smithsons on Housing’, BBC2 documentary, by BS Johnson, 1970, quoted in Alan Powers (ed), Robin Hood Gardens: Re-Visions, Twentieth Century Society, 2011. (3) From ‘The Smithsons on Housing’ as is the quotation which follows. I’m very grateful to Soraya Smithson and the Smithson Family Collection for allowing me to reproduce Sandra Lousada’s evocative pictures of the estate.